Phu Quoc is one of the fastest-growing island destinations for Australian travellers. 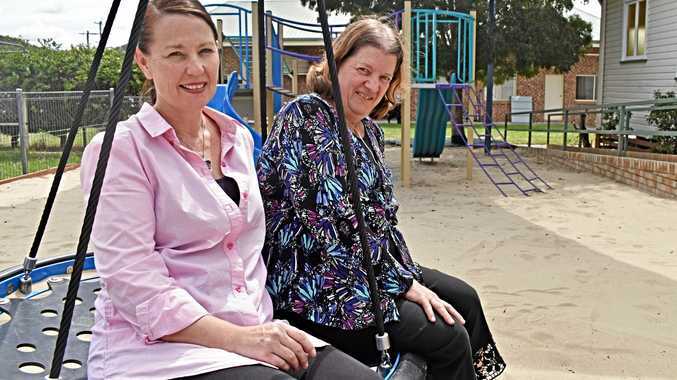 Millions are being poured into theme parks and resorts on the island which sits off the coast of Cambodia, and Australian travellers are taking notice. 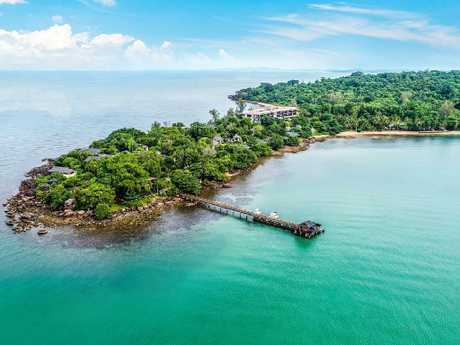 Recent Wotif figures show demand for Phu Quoc accommodation has grown 45 per cent in the past three years and searches for flights to Phu Quoc International Airport have grown by a huge 170 per cent. While there are no direct international flights from Australia (yet), Vietnam Airlines offers 10-15 flights per day to the island from mainland hubs, Hanoi and Ho Chi Minh City. AirAsia will start flying from KL next month. "When people arrive on Phu Quoc they feel relaxed," says local guide Nguyen Manh Cuong - or David, as he calls himself. "The water condition is very different to northern Vietnam because it's not affected by current coming from the river; it's very clear. The chance to do watersports is really good. "But the main idea for people coming here is not too much activity, actually." If you want to know what Phu Quoc looked like before big-name developers moved in, Mango Bay is it. No mass of concrete, swimming pool, or TVs. Just 44 rooms and villas built from rammed earth on 20ha of beachfront land that was once a mango plantation. Breezes come from the ocean and ceiling fans (some bungalows have aircon); mindfulness comes from free daily yoga or tai chi classes. There's snorkelling, paddle boarding and canoeing out front and free bike hire if you fancy a 10km cycle into Duong Dong town. 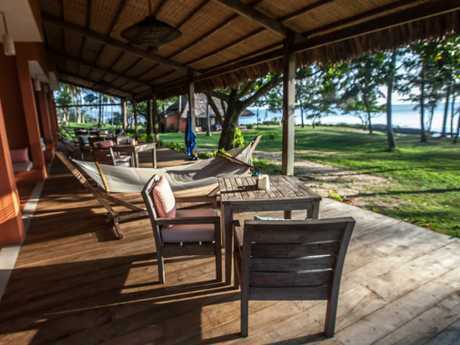 Or just chill in your hammock with a book until you're ready to stroll down to the Beach Bar for sundowners. Seafood is plentiful on Phu Quoc and freshly caught squid is a standout at the main restaurant, right on the beach. Mango Bay Resort veranda room terrace. 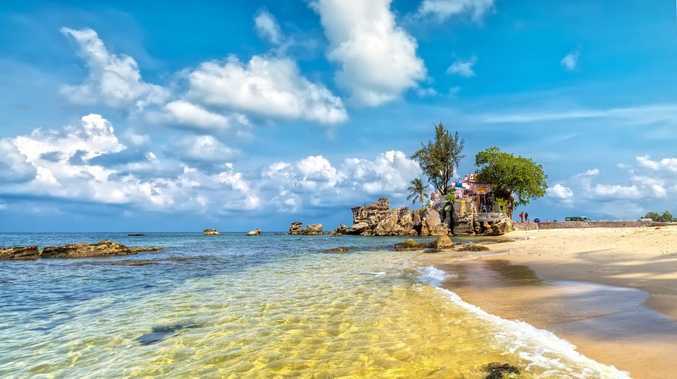 While most of Phu Quoc's action is on the southern end of the island, Nam Nghi hides away on its northeastern shore. The hotel rooms offer either sunrise or sunset views while villas are tucked within tropical gardens that reach to the water's edge. Dine on a fusion of French, Vietnamese and Thai cuisine in a treehouse restaurant under the cane lobster pot lights with a front-row seat to the sparkling blue lagoon. To reach the resort's Rock Island Bar, wander down the jetty and hitch a ride across the bay in time for sunset. When you're not rock-hopping over to the bar, grab a kayak, go snorkelling, or just laze around the pool. It's the little touches here that make it special - green silk robes, authentic local dishes on the breakfast buffet, and deep stone bathtubs. Nam Nghi on Phu Quoc Island. There's theming and design and then there's JW Marriott Phu Quoc. What's real? What's imaginary? Who could really know! You'll feel like Alice falling down the rabbit hole at this fantastical resort on Phu Quoc's Khem Beach where famed architect Bill Bensley's brief was two words: unlimited budget. Created from a fictional tale conjured up about a colonial university that honoured French naturalist Jean-Baptiste Lamarck, the entire resort is designed as a university campus, called Lamarck. Join the Dean's Tour at 4pm daily to get your head around it. Each accommodation block is designed as a faculty - Anthropology, Fine Arts and so on - with palatial rooms and beach and pool views. One thing's for certain: Your Instagram feed will blow up here. 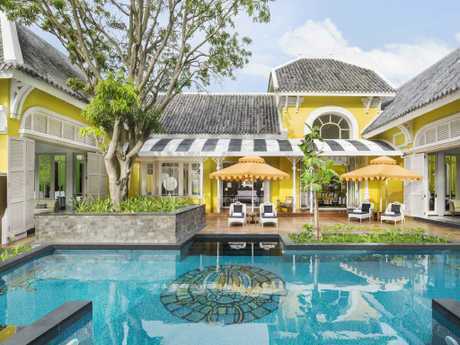 JW Marriott Phu Quoc Emerald Bay Resort & Spa.